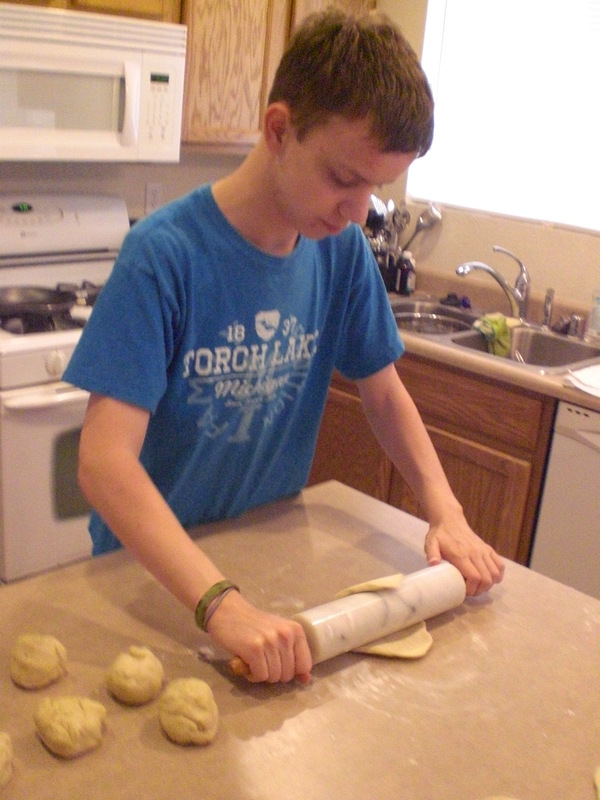 cooking | My Journeys Through Life . . . Herding Cats In New Mexico! This post may have affiliate links. You won’t spend more by using my link, and it will allow me to afford the product involved. You all know that our family has been making meals for the freezer for over a year now. I wanted to share the most recent set we’ve done using MyFreezeasy. My main working partner during this process is usually “The Artist,” and one or another of his brothers goes with me to do all of the pre-prep shopping. Here, “The Artist” and I are putting it all together . . .
And here, the bounty of our efforts! 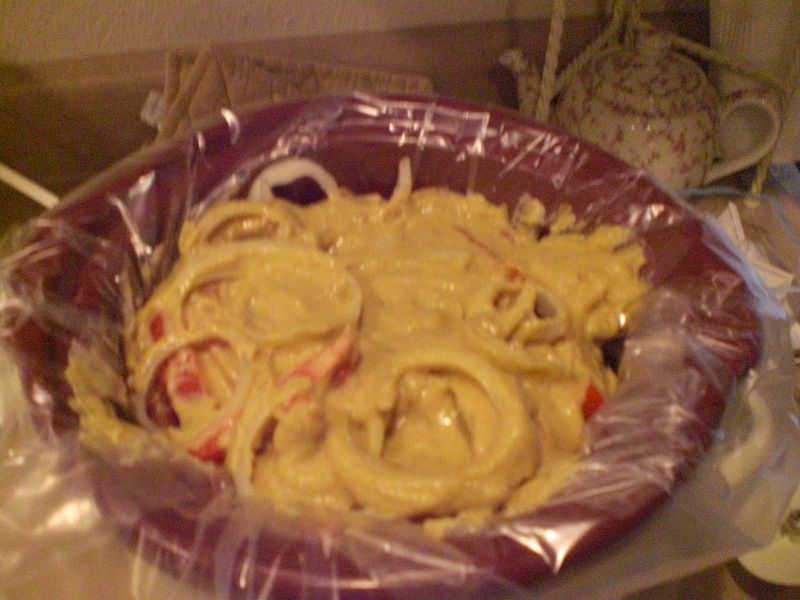 Plus, I now also have in the freezer a gallon freezer bag with the extra chicken in BBQ sauce! Not bad for just a couple of hours in the kitchen! Oh my, were the boys and I excited when we opened the box from the Notgrass Company containing the complete American History curriculum we were going to review! This curriculum is absolutely beautiful, and so very easy to use! I really don’t have to do any teacher prep, other than to make sure we have the materials for the family activity listed for each unit, if we choose to do it. So far, we’ve done just one of them, because the others either didn’t interest us or were a bit overwhelming for our household. 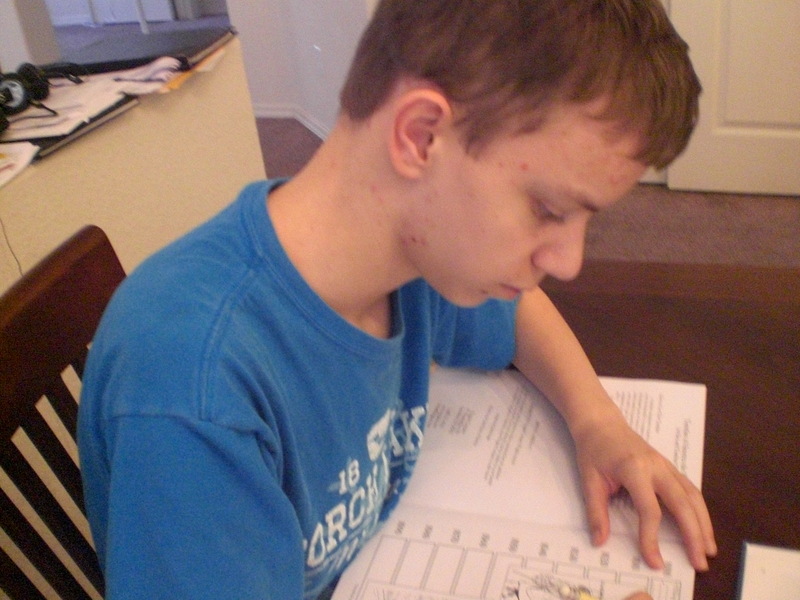 We’ve chosen to work on this as a group, since my boys are at different levels of ability due to ages and varying special needs, and we take from two to four days per lesson. I read the actual lesson out loud, while we all look at the illustrations and photos given (which takes perhaps more time than it’s supposed to, because my boys love to ask questions and discuss what is in the lesson as we go). Then, there is generally a selection to read from “We the People: Words From the Makers of American History”, which is also a read-aloud. After that, we do the various end of lesson activities, which range from “thinking biblically” (for which they each have their own 3-ring binder), to vocabulary (which we often do orally), to a map page, and a page in the Student Workbook. All of this, as I said, usually takes us anywhere from two to four days, but we stretch it like that primarily because I have found that for my boys, the knowledge will stick better that way. The author of this curriculum, Charlene Notgrass, makes a point in the introduction to tell us not to be a slave to the written schedule, but to make it work for us, so that’s precisely what we are doing, and it’s working! Therefore, although this is written as a one year curriculum, we will be stretching it out for as long as it takes to go through it, and then, perhaps go back and do it again, using the “America the Beautiful Lesson Review” Book when the boys are older. 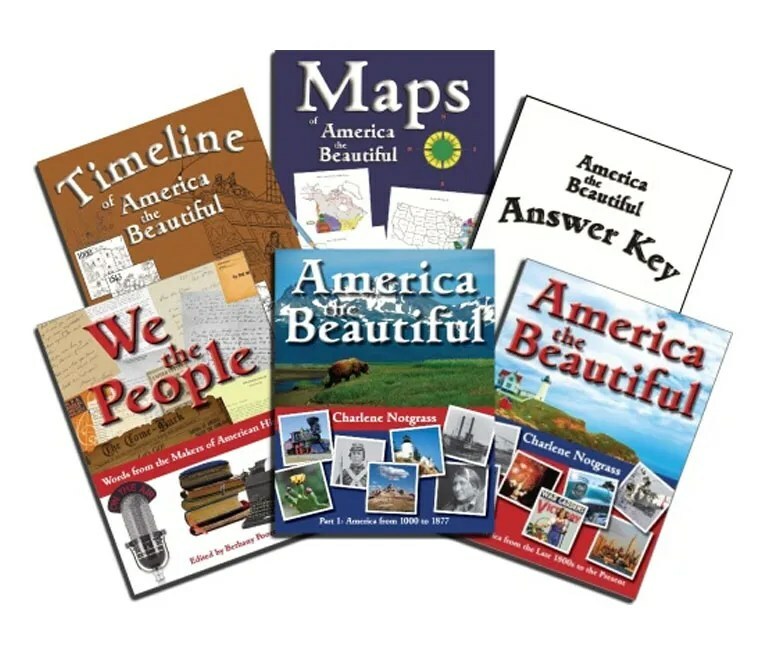 The first five books go with “America the Beautiful: Part 1”, with the second five going along with “America the Beautiful: Part 2”. To get us started, I purchased the first three novels, and will get the rest as we get close to needing them. All are easily available at bookstores or your library, with the possible exception of the final book assigned, which was written by the daughter of the author of this curriculum. 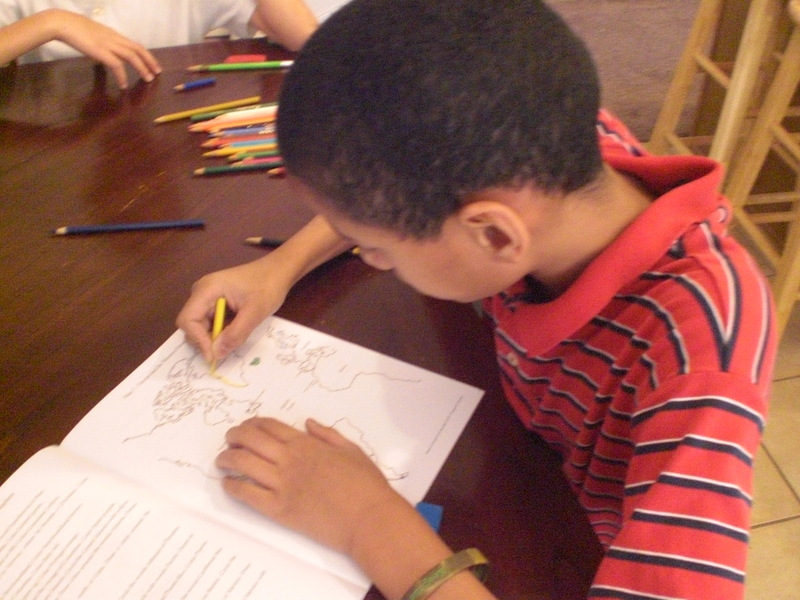 I was a little bit nervous about whether or not my boys would (a) enjoy this curriculum, and (b) be able to do the work involved, but they really do like it, and because we are doing it together, and they are taking turns on each map lesson and student workbook lesson, they are handling the work quite well. Of course, if anyone looked at either of those books, they would immediately be able to tell that four different people had written on each and every page! 🙂 Doing the workbook and map book this way makes it much more manageable for my children. We do the timeline book orally together, and then “The Artist”, who has the easiest time with writing things down, actually writes the entry into the space provided. If you would like to view samples of the different books in this curriculum, you will find them here. You will find the table of contents and a sample unit from “America the Beautiful: Part 1”, the table of contents, a sample unit and the index from “America the Beautiful: Part 2”, sample pages from “We the People”, sample maps from ” Maps of America the Beautiful”, sample pages from “Timeline of America the Beautiful”, and you may view the “America the Beautiful Answer Key”. Here is “The Artist”, copying an entry into the timeline . 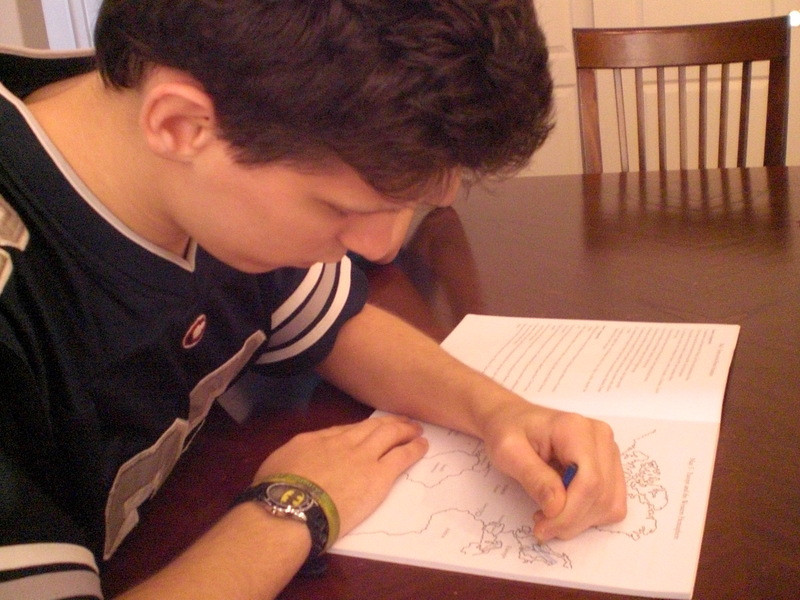 . .
“The Batman”, coloring in a section of one of the maps . . .
“Mr. Loquacious”, also doing map-work . . .
and “The Puzzler” working with “The Artist” on one of the Student Workbook pages . 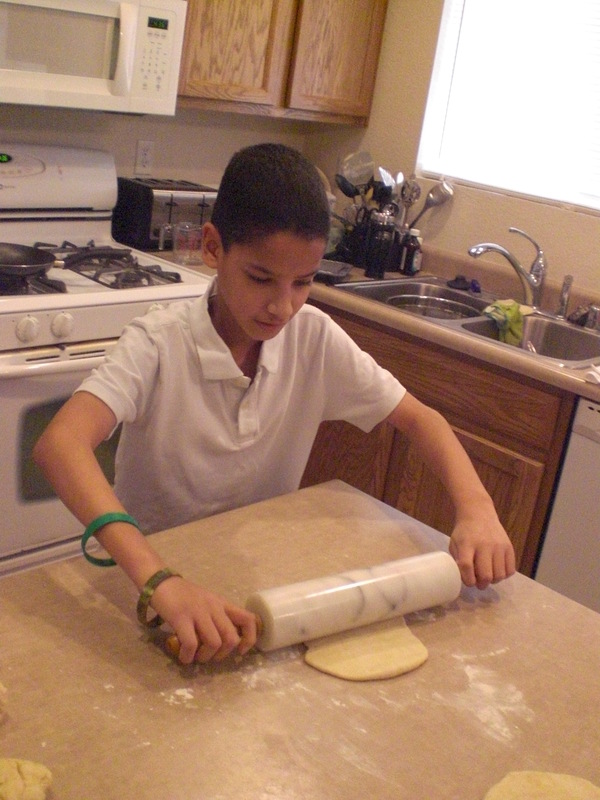 . .
One of the end of unit family activities was to make Navajo Flat bread, which we did one evening when my husband had offered to make “breakfast for dinner”. It was very easy, and the boys and I all worked on it together. This is all that we needed to make a batch of Navajo Flat Bread . . . 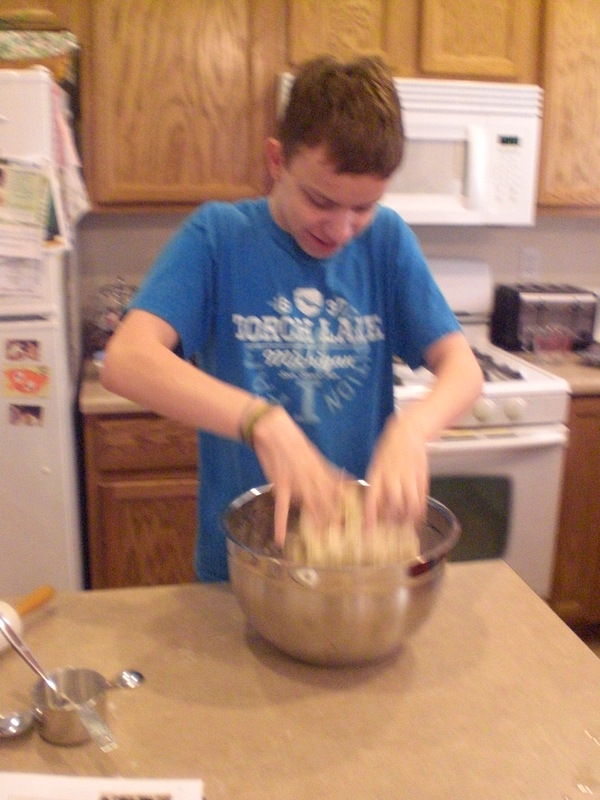 Here are pictures of each of the boys taking a turn at hand mixing the dough . . .
“The Batman” . . .
“The Puzzler” . 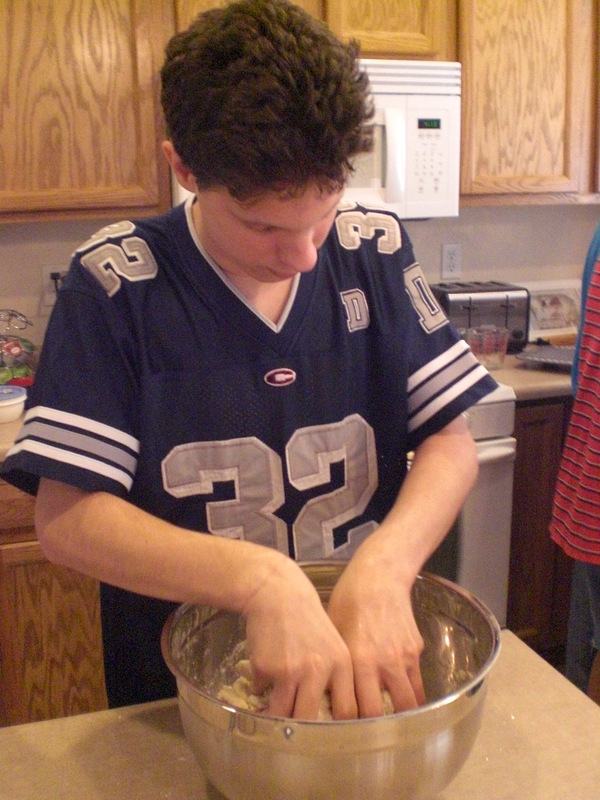 . .
Then, I kneaded the dough . . .
after which we were instructed to let it rest for ten minutes. Then, we divided it into ten balls and began rolling! “Mr. Loquacious” . . .
“The Artist” . . . 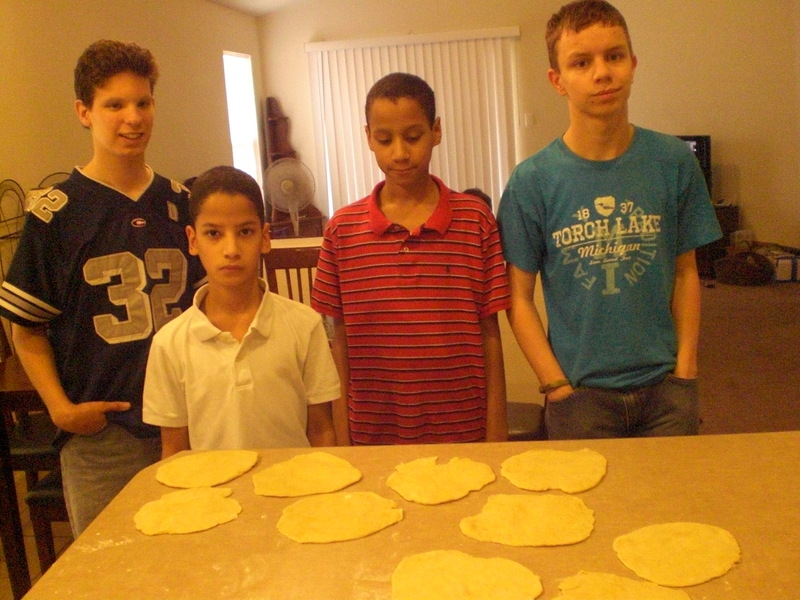 Here are the boys with all ten circles rolled out . 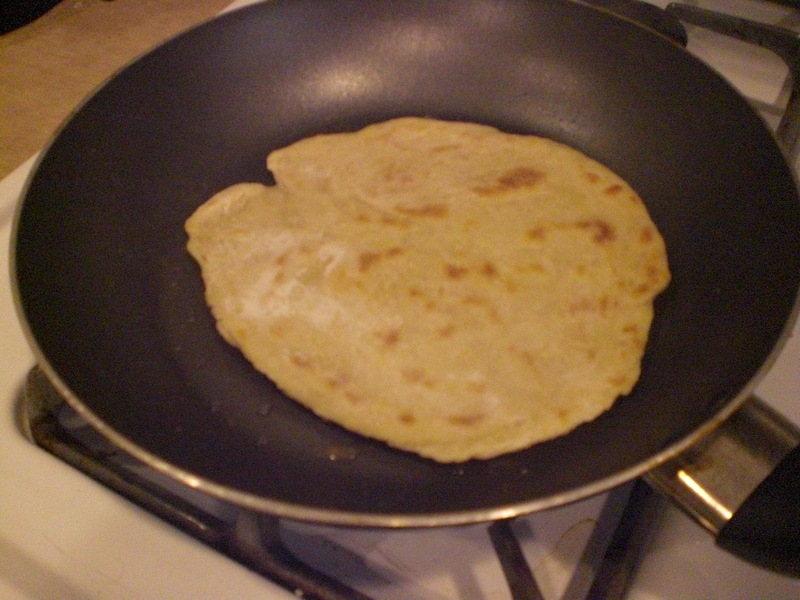 . .
and finally, a piece of Navajo Flat Bread in the process of being fried! The bread was soft, and tasted very good with butter and honey on it. 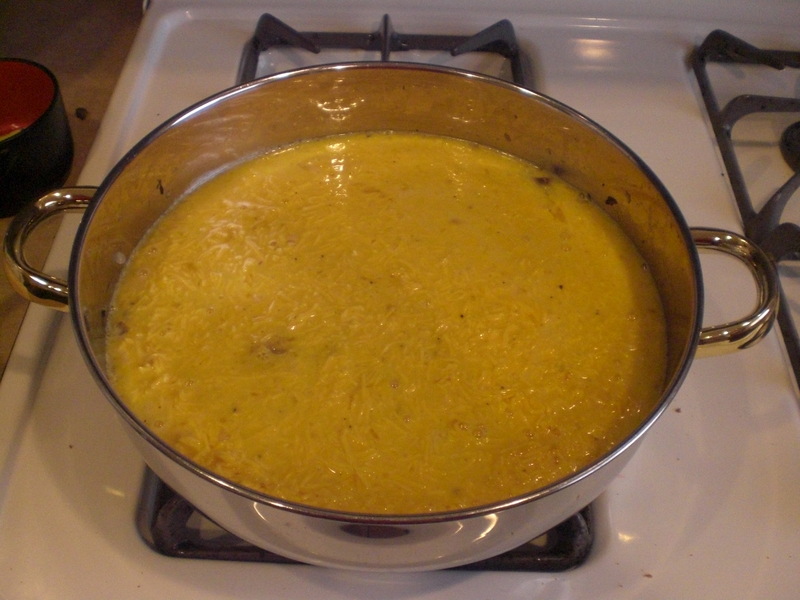 It was a tasty addition to our scrambled eggs with sweet onion and ham! The “America the Beautiful Student Workbook” is available here for $11.95, and “America the Beautiful Lesson Review” is available here for $9.95. For the most part, “America the Beautiful” is definitely a hit in our house, and we highly recommend it! The only thing I wish would be different would be to have (especially in the workbook!) Bible verses to be from the KJV. That’s the only Bible my family, and my church uses, so when a workbook page uses a different version, I either have to re-create the page, or go ahead and do it, using it as a lesson in why we believe as we do. I chose to do the latter here, because the only way the rest of the page worked was by using the verse as given. 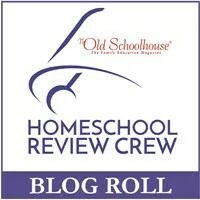 Other members of the Schoolhouse Review Crew reviewed this and other products from the Notgrass Company. Please cruise on by and see what they thought! I was so excited to be chosen as one of the reviewers for Simplified Pantry written by Mystie Winkler! As a reviewer, I was given access to three different products, and asked to choose one to use during the review period so I could tell my readers about it. I chose Mystie Winkler’s e-book Simplified Dinners, because I am ALWAYS looking for some way to simplify this part of my life, while at the same time, making sure my family is well fed with meals they actually enjoy. Well, Simplified Dinners is a definite winner with us! This is a 30 page e-book, which I chose to print out and put into a three-ring binder. This is not a “cook-book” like I was used to, rather it is more of a how-to book. In her e-book, Mystie has given us first an explanation as to how and why she came up with this system, an explanation which really struck a chord with me. She was really tired of thumbing through and bookmarking cookbooks, recipe cards, etc, and having to keep track of ingredients needed. This system helped Mystie to pare down her pantry, purge her recipes, and even made it easier to let her children help in the kitchen. That last one turned out to be important for me, as during the review period I had surgery, and am currently unable to stand at the stove and cook, so my husband has had to take over a lot of what I normally do, with at least one of our children (“The Artist”) helping some. More on that later! 1.Find out what’s on sale or what coupons you have. 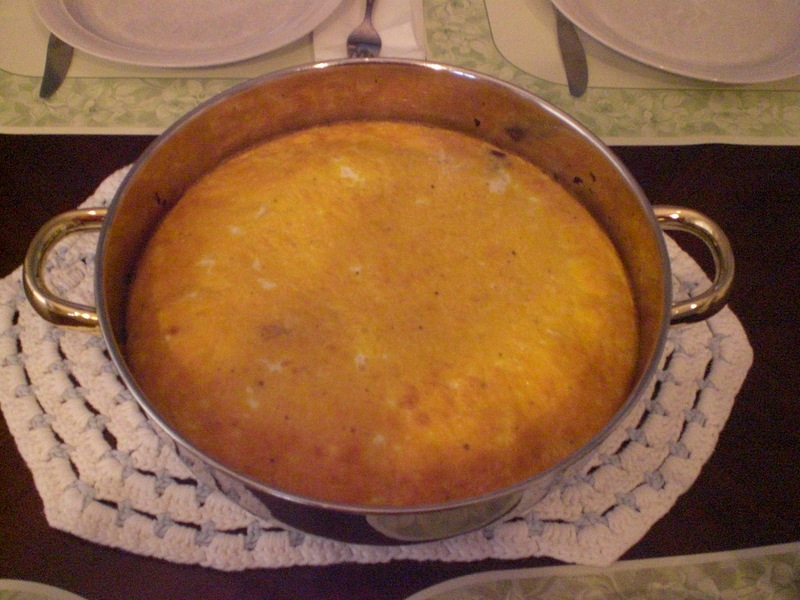 2.Find recipes you can cook and want to eat. 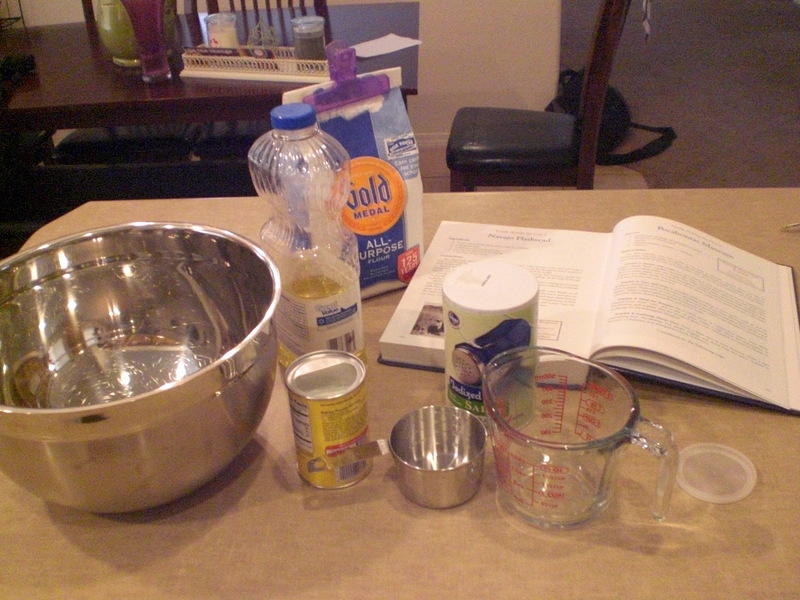 3.Figure out what ingredients you need to cook those recipes. 4.Try to mesh the ingredients you need with what’s on sale. 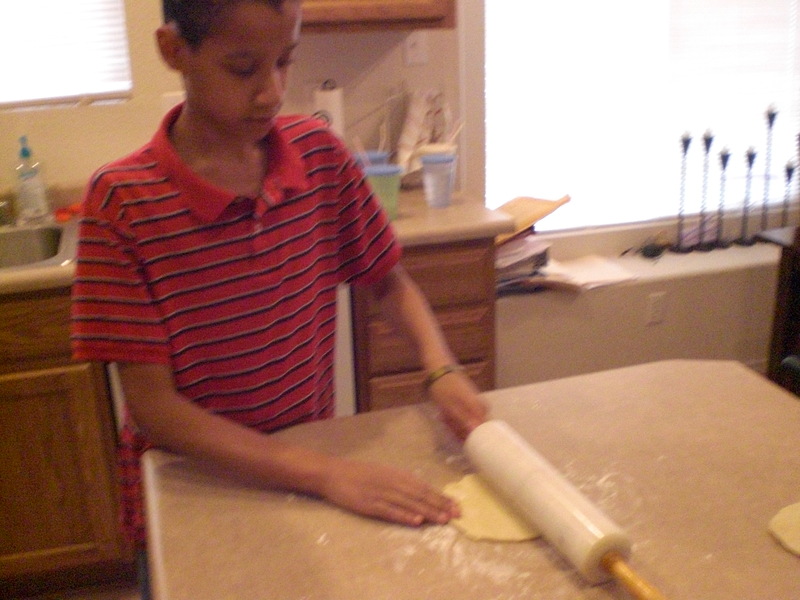 7.Remember what you’re going to make for dinner when, and pull it off. 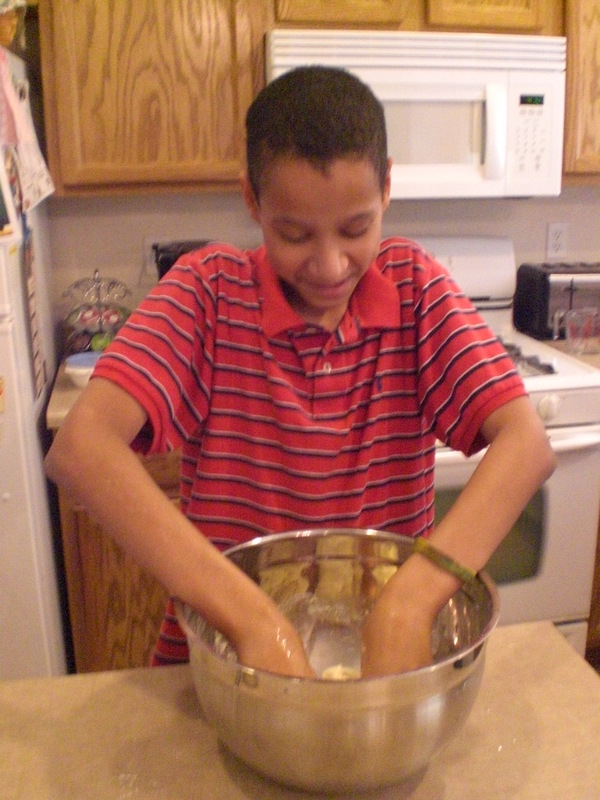 8.Use the perishables before they go bad. That was me, before this review, to be honest. 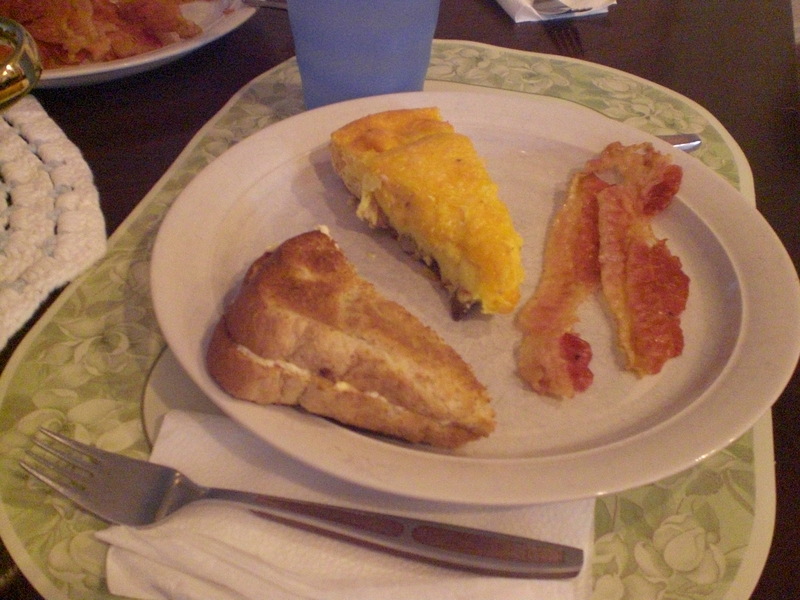 The e-book Simplified Dinners is SO easy to implement . . . if *I* could do it, anyone can do it, believe me! 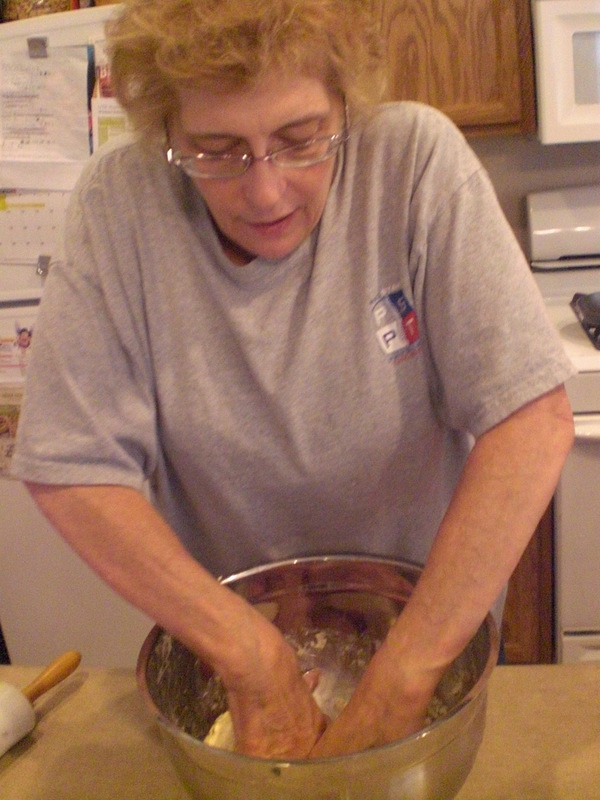 I make no claims whatsoever to being a “domestic diva”, lol! 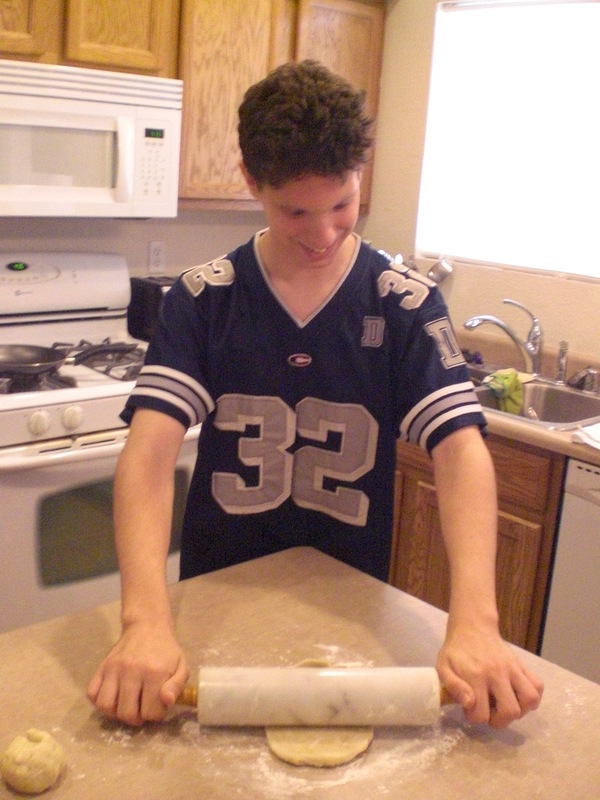 What Mystie has done, rather than create yet another recipe book, is to give a basic method for each of the above mentioned categories, along with anywhere from three to six or more alternative ways to make the same basic dish into something different. 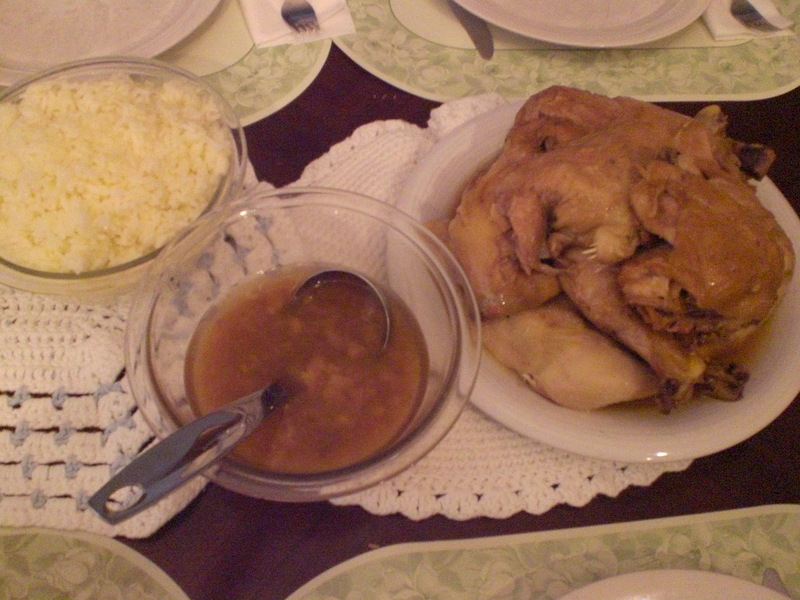 For example, Chicken-in-a-Pot gives the basic method for cooking a whole chicken, but then gives us three other ways to do it, called “Sassy”, “A More Interesting Basic”, and “40 Cloves of Garlic”. 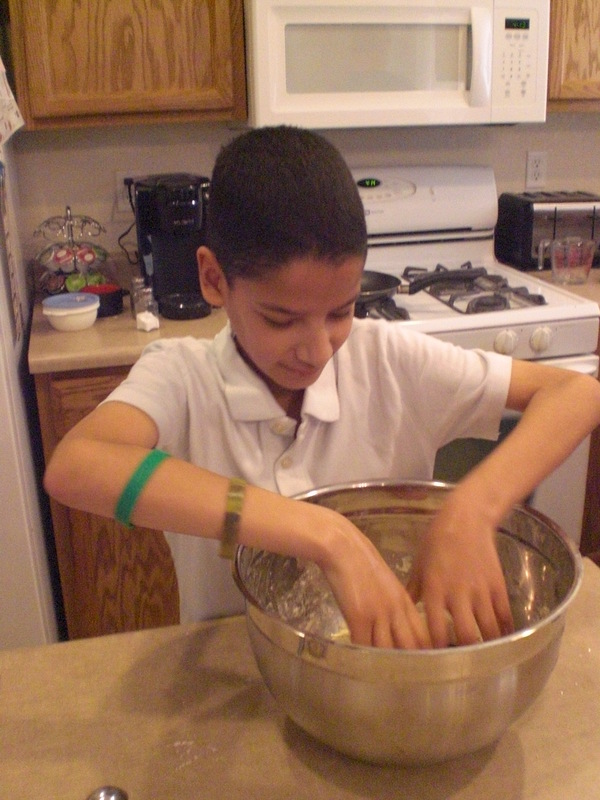 Each alternative idea switches up some ingredients, while using the basic method. At the end of the e-book, Mystie even gives us a sample winter menu plan and a blank menu planner. If you’d like to get a better look at what you’ll be getting, you can download a sample here, but really, I’m telling you that at the price of $12.99, Simplified Dinners is well worth the purchase! 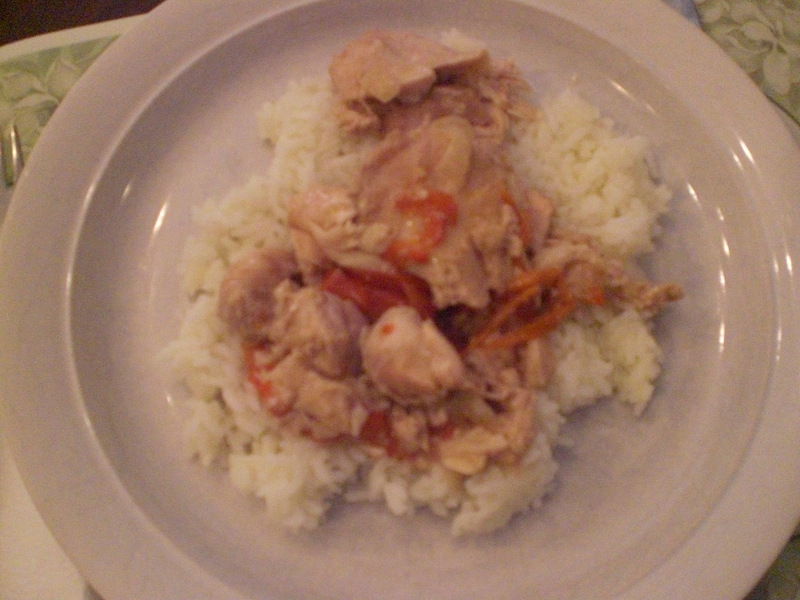 Peanut Butter Chicken (in the slow cooker) . . . 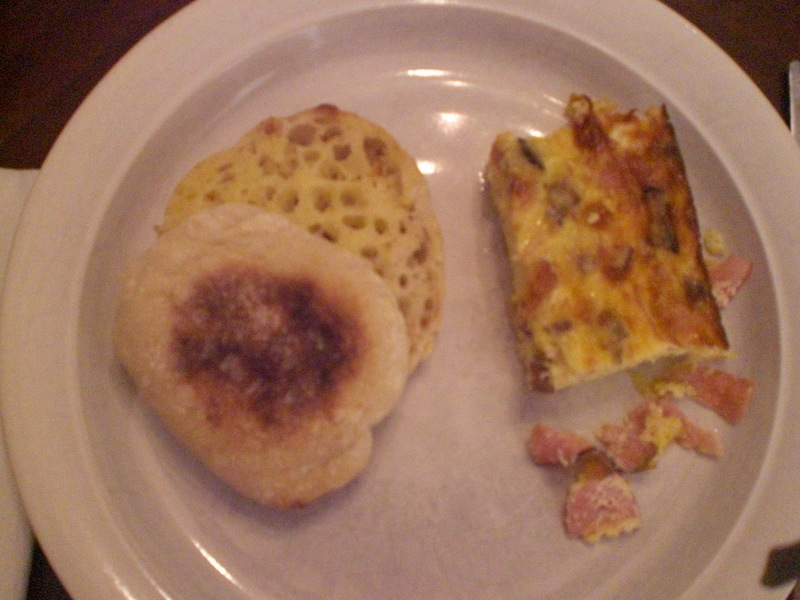 Here, we have the Oven Omelette, which was a huge hit at my house! Orange Honey Chicken . 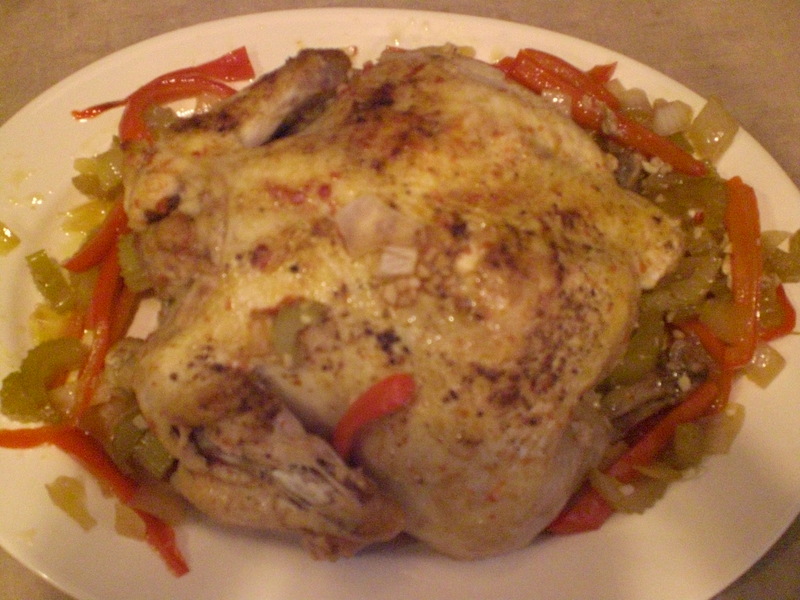 . .
Chicken-in-a-Pot (sassy version) . . .
Now then, as I said above, I am now recovering from surgery on both of my feet, and unable to do a lot of what I usually do. My husband was able to take this method, with ingredients I had made sure to have on hand, and with “The Artist” as his assistant, he made the Flexible Frittata for our supper one night! 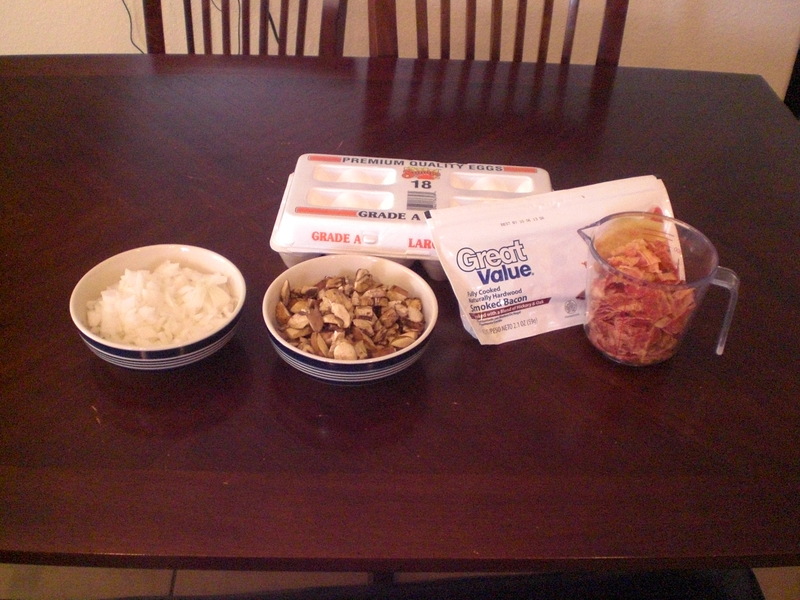 Here are the ingredients . . .
Mystie also offers a Simple Gluten Free & Dairy Free Meals edition of her e-book, also at the reasonable price of $12.99. I know a lot of people who need to find ways to feed their family without using gluten or dairy . . . this one is for you! The third product reviewed by members of the crew was Paperless Home Organization, which is available for only $3.99! I do intend to give this one a try when I’m feeling more recovered from my surgery, but I am more of a hard-copy schedule and list maker type, to be truthful. 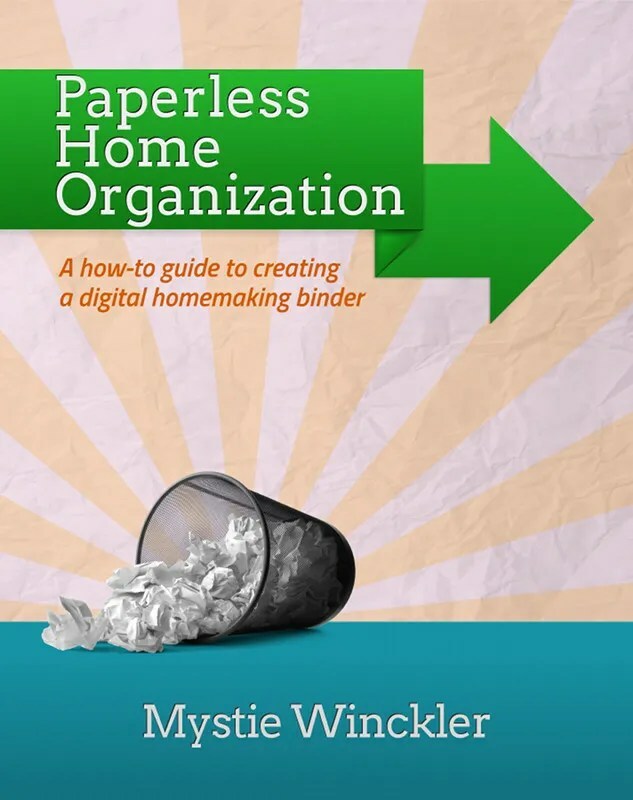 I know a lot of people who are really more likely to go paperless if given an easy way to do so, though, so here is the product if that description fits you! The prices for Mystie’s e-books are very good as they are, but right now, she is offering a discount to my readers of 30% off any or all of the e-books! Just use the code TOS2013, and you will receive this discount. You do need to hurry though, because this code will only work until June 3, 2013! Click below to find out what my fellow crewmembers thought of Simplified Dinners, Simple Gluten-Free & Dairy-Free Meals, and Paperless Home Organization!